7 Types of Packaging Coding Equipment: Which One is Right for You? Given the selection of packaging coding equipment available today, comparing and contrasting them all can be difficult. There may be models that will deliver on some of your needs but not all, while there are other models that deliver too much capability for your needs – with a higher price point to boot. This is why it’s imperative to find packaging coding equipment that gets as close to your current and forecasted needs as possible, so that the unit does not fall short and can’t meet your goals or that you don’t pay more for a machine that offers features you simply will never need. Here is a quick rundown on 7 types of packaging coding equipment, including a brief synopsis of where that particular equipment is best utilized. Wet Ink Systems: These systems are known as roller or reciprocating coders and are ideal in environments where the coding process consists of static information rather than barcodes, logos, or graphics. There is a relatively low capital cost associated with this type of packaging coding equipment. Inkjet Systems: There is a wide range of configurations with this equipment, so it may be used for both small or large characters. This makes it a particularly good choice for primary or distribution packaging. Thermal Inkjet Systems: This system has a short space between the printhead and substrate, making it a good choice for two-dimensional barcodes. Of note is the fact that it has comparably limited capabilities and a higher ink cost. Continuous Inkjet Systems: These are super fast coders that can use a variety of inks, including solvent-based inks, thermographic inks, UV-sensitive inks and UV-curable inks for a wide range of applications. 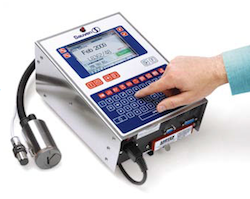 Laser Systems: These easy-to-operate systems use a non-contact process to affix information to the target, working with both continuous and intermittent packaging motion processes. These work best in environments that do not have dust, moisture, or vibration. They do cost significantly more upfront, but less over time due to the fact that there are no consumables that must be purchased. Hot Stamp Systems: This equipment works best for intermittent motion materials, including flexible substrates like labels or even flexible metals. This is not the right choice if you require variable printing. The cost of this equipment is relatively low despite its specialized nature. Thermal Transfer Systems: These are versatile machines that can code graphics, barcodes, and/or alphanumeric characters through its multi-ribbon printing process. There are machines that can handle either continuous moving materials or intermittent motion materials. There is also a wide variance in terms of price, depending on the type and size of machine selected as determined by your specific application needs. There are seven types of packaging coding equipment, including wet ink, inkjet, laser, hot stamp and thermal transfer. Each type of machine can handle specific types of information and printing process motions as well as certain speeds, volumes, and applications. Be sure to know certain printing needs, including target materials, speeds, volume, printing environment and budget when you research the packaging coding equipment you may want to invest in. Posted in Metal, Packaging Coding Systems and tagged Choosing Packaging Coding Equipment, Packaging Machines, Types Of Packaging Coding Equipment.